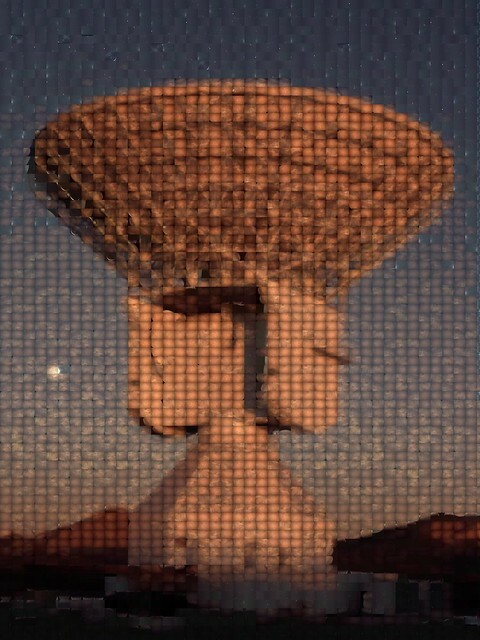 A mosaic depicting ESA's new 35m deep-space tracking station at Malargüe, Argentina, composed of several hundred low-resolution Visual Monitoring Camera (VMC) images acquired by Mars Express. On 18 December 2012, the station downloaded a VMC image from Mars Express orbiting some 328 million kilometres from Earth to mark the station's formal inauguration and the symbolic transmission of 'first data'. The image was received at ESA's European Space Operations Centre, Darmstadt, Germany, and processed by the Mars Express mission operations team. Photo mosaic generated using AndreaMosaic, an excellent piece of software!